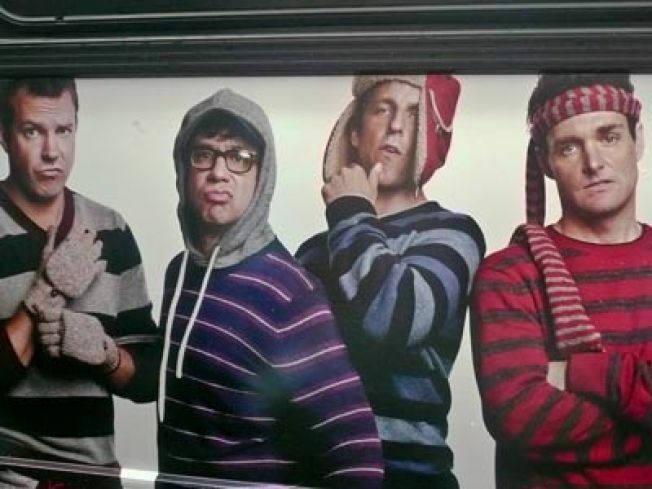 Fred Armisen rocks 'Blue Steel' alongside fellow preening SNL castmembers. Sure, he kills cats with his bare hands and is a beet-farming Machiavelli to his character counterpart Jim on "The Office," but Rainn Wilson is now also something of a catwalk superstar. Wilson, who plays Dwight Schrute on the NBC hit sitcom, strikes poses alongside a number of male stars from "Saturday Night Live" in a new holiday ad campaign for The Gap. The ad campaign lampoons the preening posturing of male models in general. The sheer dorkiness of the models adds to the effect. Wilson's character on "The Office" is not known for his masculine wiles. Nor is Fred Armisen, who poses with a come-hither pout probably most recognizable as the ridiculous "Blue Steel" pose from the Ben Stiller feature "Zoolander." Armisen is best known for portraying President-elect Barack Obama on SNL. A glowering Will Forte, a posing Seth Meyers and a defiant Jason Sudeikis also make cameo appearances on the ads, which will appear in the glossies and on the side of New York City buses. The ads falls in line with The Gap's past star-studded holiday campaigns.